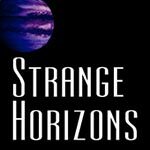 Strange Horizons is a weekly speculative fiction magazine that publishes fiction, poetry, essays, interviews as well as some of the best genre reviews that constantly inspire us to do better with our own. Needless to say, Strange Horizons is one of our favourite online publications. What is an sf magazine in the second decade of the twenty-first century? This is not, as you’ll have gathered, an idle question for me, since I currently run one. Strange Horizons, if you don’t know it, has been going since 2000, making it one of the longest-running of online sf publications. We publish new issues every Monday, including a mix of stories, poems, reviews, essays and interviews. I certainly think of SH as being part of the tradition of sf magazines that stretches back nearly a century now. But the context in which we publish is, obviously, radically different than it was for conventional magazines. One of the big differences is economic. Every issue of Strange Horizons is freely available to anyone with an internet connection; and we’re a non-profit organization with an all-volunteer staff. We pay all our contributors, but we don’t have subscribers to provide income, and nor do we rely on advertising or corporate sponsorship. Instead we are an entirely independent entity, supported by our readers in annual fund drives. It’s the crowdfunding model, in other words, and it’s been working for us for thirteen years so far. So, anyone want to guess why I’m here today? Correct! As I write, we’re one week into this year’s fund drive, and have raised just over $1,200 of our $11,000 goal. If we meet our target, we can publish another year of the magazine — so I’m here to try to persuade you that would be a good thing. – Poems by Amal El-Mohtar, Jane Yolen and Erik Goranson. – Regular columns by, among others, Genevieve Valentine on films, Renay on the changing nature(s) of fandoms, and Rochita Loenen-Ruiz on race, representation, and writing as a woman of colour. – Reviews — and here, rather than make my own selections, I’ll direct you to a list by Jared at Pornokitsch. – Interviews with Adam Roberts and Ken Liu, the SF Count of gender balance in review magazines, essays by Judith Berman on science fiction without the future, and by John Rieder on the search for sf’s origins. That’s the long version, anyway. The short version is to answer my opening question by saying we at SH believe that in the twenty-first century, an sf magazine has to be a space for a global, inclusive and progressive conversation. We aim to showcase work that challenges and delights our readers, by new and established writers from diverse backgrounds. My list above includes writers of colour, queer writers, writers of at least six different nationalities: we want to continue, and showcase more such voices. But don’t support us just because you believe in those aims in the abstract! Support us if you like what we’re publishing. Alternatively, support us for more mercenary reasons; we’re not that proud. In this fund drive as every year, we have a prize draw for everyone who donates to the magazine — at the moment it includes books by Alaya Dawn Johnson, Lavie Tidhar, Lauren Beukes, Tom Pollock, with more being added each Monday. I’ll also note that if you’re in the US, since we’re a non-profit your donations are entirely tax-deductible. And that, I think, is that. Thanks to Ana and Thea for letting me borrow their space briefly; and thanks to all of you for reading through the post, and perhaps following a few of the links. I hope you enjoy the magazine!